Data is from the December 2017 Winterberry Group report titled "The State of Data 2017" in partnership with Data & Marketing Association (DMA) and Interactive Advertising Bureau (IAB) and sponsored by Criteo, Deluxe, Equifax, Epsilon and LinkedIn. Data sources used in the development of the audience data market include aggregation of financial information from product, service and technology providers and publicly available information sources on data product investments, public company revenues and financial dynamics collected during May-November 2017. 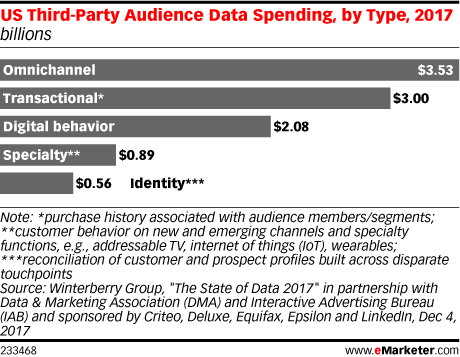 Audience data expenditures include spending on data assets licensed from third-party providers, as well as service- and technology-oriented offerings that support the use of audience data for marketing and advertising. Information excludes "insourced" data-related investments, spending on market research and other aggregate insights (rather than campaign-oriented marketing), spending that is bundled with other media assets and spending that is directed to enterprise priorities other than advertising, marketing or media.